Today NASA released its report for March, 2018 global temperatures. The average for the first three months of 2018 is 0.82°C above the 1950 – 1981 average. This means the planet is still on target to hit the UN maximum goal of 1.5°C around 2032. Below is the current graph showing the exponential growth in global temperatures. The line shown is better able to explain the data than a straight line does. For example, the R2 test to account for variance is 0.97 for the exponential curve and only .84 for the linear fit. See Wolfram Alpha for statistical details. 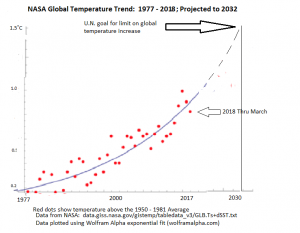 Of course the climate deniers are apt to look at the temperatures for 2016, 2017, and 2018 (so far) and shout, “Global Temperatures are falling rapidly!” This is what they did after the record breaking year of 1998, when it appeared that temperatures had leveled off until about 2012 or so. But the consecutive record breaking years of 2014, 2015, and 2016 silence that spurious argument. Because the overall trend is very clear, just by looking at the graph. And with all the climate catastrophes that have broken out with our current increase (around 0.9 degrees based on the line as shown), we can barely imagine the chaos that will ensue with 1.5°C increase or the 2.0°C increase that the UN says is the top limit that the world can withstand. We need to intensify our efforts to achieve 100% renewable energy and 100% elimination of fossil fuels in transportation, buildings, agriculture, and all of our economy. We also need to stop deforestation and vastly reduce consumption of meat if we stand any chance to stabilize the climate.